Brandy-snap basket with vanilla ice-cream and strawberries will forever hold a special place in my heart. It was the dessert that we had on our wedding day. It was our 4th year wedding anniversary last Friday (OMG, has it really been 4 years?). So I thought I will attempt to recreate this very special dessert. It came out perfect on my first attempt. A little fussy to make, but not difficult at all. I do love the delicate lace-like texture of the basket. In an electric stand mixer with paddle attachment, beat butter and brown sugar until light and fluffy. Add glucose and brandy, beat until well incorporated. Using a spatula, carefully fold in flour until just combined. Cover and refrigerate for an hour until firm. Don't leave the mixture in the fridge for too long or it will be too stiff to work with. Preheat oven to 180 degrees celcius conventional (or 160 degrees celcius fan-forced). Using a tablespoon, scoop out a tablespoon of mixture. Roll out the mixture between two sheets of baking paper to about 10cm diameter and 1mm thick. For a neat finish, use a large 10cm cookie cutter to make 10cm round, scrap off excess around the cookie cutter. If the mixture gets too soft to work with and sticks to the baking paper, put it in the freezer for 1 minute to firm up. Place the disc on a baking tray line with baking paper. Bake for 8 minutes or until golden brown. The disc will starts to bubble, creating the beautiful and delicate lace-like texture. Keep a close eye on it as it will start to burn very quickly. Remove from oven, and cool for 15 seconds. Working very quickly, place the disc on an upside-down bowl or mug. Carefully peel off the baking paper, and press the sides of the disc to form a basket. Set aside to cool. 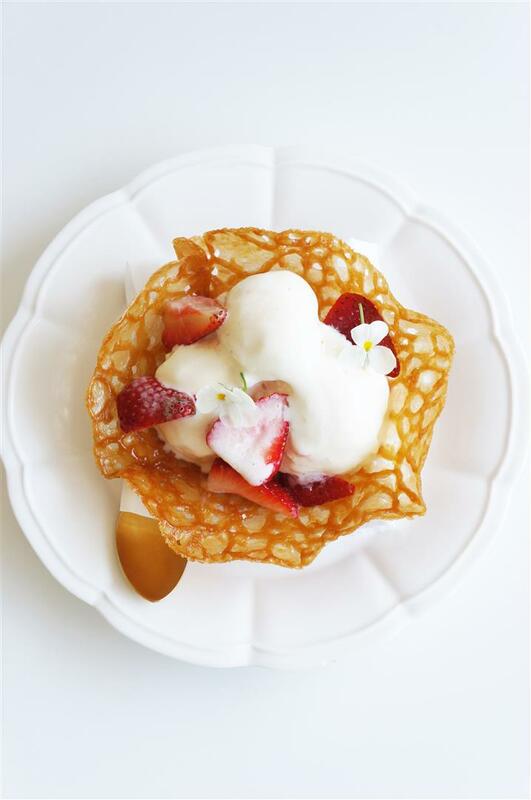 Serve with vanilla ice-cream and fresh strawberries. These definitely sound like a special dessert! I've never tried this before but just know I would love it! !